Ignore the rather over excited title to this blog post for now as I have plenty of other goodies to share before we get to the main event. Last week I found myself traveling back to the Midlands to attend to some family business. By Friday afternoon all was taken care of (in spite of the driving rain) which meant that we had a couple of hours to kill. Fortunately Upton Warren nature reserve is just down the road so we popped along to look for a recent arrival. Our target was the area of water known as the Flashes and after a bit of scanning we spotted the Pectoral Sandpiper feeding on the mud at the far side. Despite the rather poor light we got very good views allowing us to see all the necessary markings to be certain of the identification. This was yet another life tick for me in what is now my most successful stretch of birding ever. Also to be found out on the water were a single Common Sandpiper, thirty or so Shovellers in eclipse plumage, numerous Teal and best of all loads of Snipe. I can't be certain of an exact number but wherever I looked a Snipe soon popped into view. I have never seen so many in one location before and took the opportunity to really study their plumage through the telescope. The intricate markings to the plumage are simply stunning and one of the main reasons they manage to blend in so well with their surroundings. With the light really starting to fade we managed to spot two Stock Doves on some recently ploughed farmland before we started to head back. As it turned out we hadn't quite got the timing right as a short but very heavy shower soon had us soaked to the skin. Saturday morning and we were back at the reserve again hoping for some more views of the Pectoral Sandpiper. 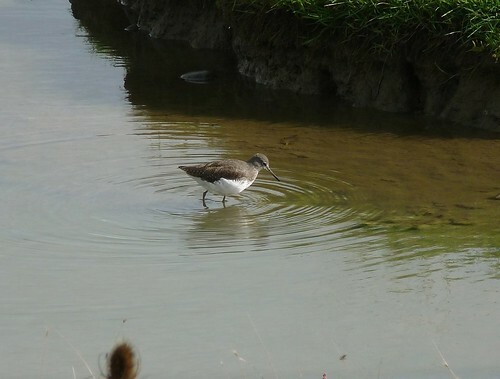 Unfortunately it was not to be but we were instead treated to the presence of three Green Sandpiper. One individual even came close enough to the hide to allow me to get some record shots which can be seen below. 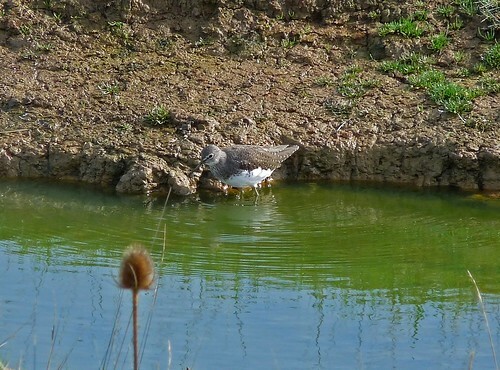 The Common Sandpiper was also back making it three different Sandpiper species in the space of 24 hours from the same hide. Not bad going. New additions included a male White Wagtail, two Dunlin, a single Little Grebe and yet more Snipe. Also worth mentioning is the flock of Goldfinch that spent a long while feeding on the seed heads in front of the hide. I have noticed large numbers of them wherever I have been recently which suggests that they must have had a pretty successful breeding season. All too soon and we had to move on once more. However I had a plan up my sleeve for the journey home that was to prove a tad more successful than the Hoopoe one (yes I am going to talk about the post title now). Instead of driving back to Swansea via the direct i.e. boring route, I instead elected to drive into the heart of mid Wales to Rhayader, or to be more precise the small village of Llanwrthwl just south of the town. Here we found a typical Welsh country road that started off as a single track and got narrower and narrower as it climbed higher and higher until eventually it petered out all together and we were left to turn around in the mud. I didn't care though as not far away I had spotted the large flock of birds that we had come to see. Initially I could only identify Starlings (about twenty or so) before I realised that the majority of the other birds were Mistle Thrushes. As with the Snipe I have never seen so many in one location before and estimate that there must have been at least thirty birds flying between the few trees that mark the transition to the high ground. Then I spotted what I was hoping for. Sitting half way down a dead tree was a male Ring Ouzel, its white breast showing perfectly in the late evening sun. I passed the telescope to Emma so that she could have a look and immediately began to think that I must have been mistaken. Such has been my desire to the see an Ouzel that I couldn't quite believe that I had finally managed it or that it had been so easy. I had another scan and found two more flying around, but their numbers could easily have been higher. Eventually we were driven back down the hill to the Elan Valley visitor center as the weather once again closed in. Still on cloud nine we tucked into some food to prepare for the journey south. The car park at the visitor center is full of Rowan Trees in full berry at the moment and several Song Thrushes were taking full advantage. I have heard that Ring Ouzels are known to frequent these trees from time to time but did not expect to see one myself. But that is exactly what we did see. Just briefly what looked to be a juvenile bird appeared next to one of the Thrushes. It was far too dark for photographs but just to see my fourth individual of the day was enough, even more so considering it was another life tick for me. Simply stunning. With good weather promised for this weekend I am off down to the Gower Peninsular for the first time in a while. Who wants to place a bet on when I will see my first Redwing of the autumn? I'm feeling lucky at the moment, and to be honest who can blame me. Check out the Rhayader by Nature blog which originally posted the Ring Ouzel location.